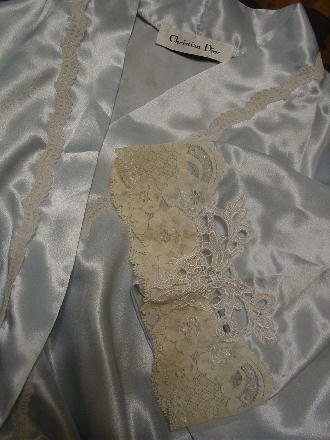 This vintage shiny, smooth pale blue robe is by Christian Dior. The fabric is a synthetic, but we don't know which one - the tag is unreadable (blank). It has inner 17" long waist ties to keep the robe in place. There are some small surface snags on the exterior surface. The sleeves have 2 to 2 1/2" of antique white lace with a large white lace insert at the top of the sleeve end. It has side seam slash pockets. There is also a 3/8" wide lace trim around the neckline down the front and around the bottom hem. It has belt loops and a fabric matching belt (2 1/8" wide by 72" long). It was worn in several foreign films. shoulder to hem 41 1/2"